In 1610, Galileo redesigned the telescope and discovered Jupiter's four largest moons. Nearly 400 years later, NASA's Hubble Space Telescope used its powerful optics to look deep into space—enabling scientists to pin down the age of the universe. In a paper published on July 18 in The Astrophysical Journal, a team of scientists led by Craig DeForest—solar physicist at Southwest Research Institute's branch in Boulder, Colorado—demonstrate that this historical trend still holds. 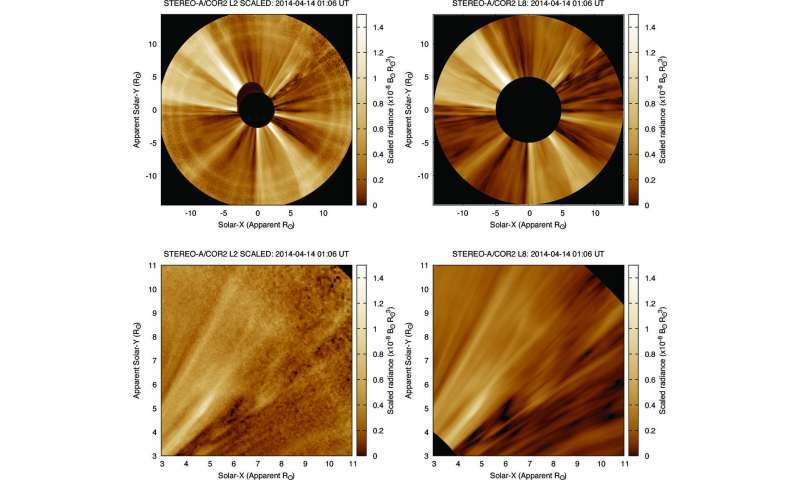 Using advanced algorithms and data-cleaning techniques, the team discovered never-before-detected, fine-grained structures in the outer corona—the Sun's million-degree atmosphere—by analyzing images taken by NASA's STEREO spacecraft. The new results also provide foreshadowing of what might be seen by NASA's Parker Solar Probe, which after its launch in the summer 2018 will orbit directly through that region. Answering this question requires observing the outer corona—the source of the solar wind—in extreme detail. If the Sun itself causes the turbulence in the solar wind, then we should be able to see complex structures right from the beginning of the wind's journey. But existing data didn't show such fine-grained structure—at least, until now. To understand the corona, DeForest and his colleagues started with coronagraph images—pictures of the Sun's atmosphere produced by a special telescope that blocks out light from the (much brighter) surface. So they ran a special three-day data collection campaign during which COR2 took longer and more frequent exposures of the corona than it usually does. These long exposures allow more time for light from faint sources to strike the instrument's detector—allowing it to see details it would otherwise miss. But the scientists didn't just want longer-exposure images—they wanted them to be higher resolution. Options were limited. The instrument was already in space; unlike Galileo they couldn't tinker with the hardware itself. Instead, they took a software approach, squeezing out the highest quality data possible by improving COR2's signal-to-noise ratio. The signal-to-noise ratio is an important concept in all scientific disciplines. It measures how well you can distinguish the thing you care about measuring—the signal—from the things you don't—the noise. For example, let's say that you're blessed with great hearing. You notice the tiniest of mouse-squeaks late at night; you can eavesdrop on the whispers of huddled schoolchildren twenty feet away. Your hearing is impeccable—when noise is low. The problem isn't your hearing—it's the poor signal-to-noise ratio. COR2's coronagraphs are like your hearing. The instrument is sensitive enough to image the corona in great detail, but in practice its measurements are polluted by noise—from the space environment and even the wiring of the instrument itself. DeForest and his colleagues' key innovation was in identifying and separating out that noise, boosting the signal-to-noise ratio and revealing the outer corona in unprecedented detail. The first step towards improving signal-to-noise ratio had already been taken: longer-exposure images. Longer exposures allow more light into the detector and reduce the noise level—the team estimates noise reduction by a factor of 2.4 for each image, and a factor of 10 when combining them over a 20-minute period. If you've ever done a "double-take," you know a thing or two about smoothing in time. A double-take—taking a second glance, to verify your first one—is just a low-tech way of combining two "measurements" taken at different times, into one measurement that you can be more confident in. But when it comes to the corona, there's a problem: it's a dynamic, persistently moving and changing structure. Solar material is always moving away from the Sun to become the solar wind. Smoothing in time would create motion blur—the same kind of blurring you see in photographs of moving objects. That's a problem if your goal is to see fine detail. To understand how this approach works, think about taking snapshots of the freeway as cars drive past. If you simply overlapped your images, the result would be a big blurry mess—too much has changed between each snapshot. Now DeForest and his collaborators had high-quality images of the corona—and a way to tell how much it was changing over time. The most surprising finding wasn't a specific physical structure—it was the simple presence of physical structure in and of itself. 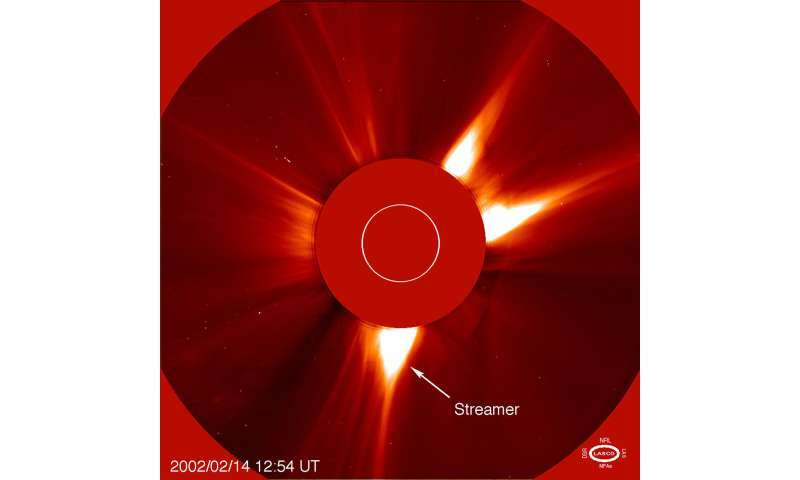 Coronal streamers—also known as helmet streamers, because they resemble a knight's pointy helmet—are bright structures that develop over regions of the Sun with enhanced magnetic activity. Readily observed during solar eclipses, magnetic loops on the Sun's surface are stretched out to pointy tips by the solar wind and can erupt into coronal mass ejections, or CMEs, the large explosions of matter that eject parts of the Sun into surrounding space. Physicists have long believed the Alfvén surface was just that—a surface, or sheet-like layer where the solar wind suddenly reached a critical speed. But that's not what DeForest and colleagues found. At a distance of 10 solar radii, even back-to-back images stopped matching up well. But they became more similar again at greater distances—meaning that it's not just about getting farther away from the Sun. It's as if things suddenly change once they hit 10 solar radii. "Highly structured" means this is not the quasi-neutral cloud of gas jonesdumb continuously spouts off about. There may be approximately the same amount of ions/electrons in a given volume but the observed structure shows beyond a shadow of the doubt that there is charge separation. The filamentary and cellular nature of plasma has been known for almost 100yrs due to lab experiments, only a plasma ignoramus would suggest otherwise. Enter jonesdumb and his erroneous beliefs of plasma physics.